At Markell we understand that materials knowledge is key to our customers needs and over the years we have developed considerable experience with a wide range of materials as detailed below. Our specialist areas are the machining of stainless steel and engineering plastics. However, we also work with a full range of other stainless steel materials such as 304L and 316L which are both lower carbon options used where secondary welding is required. For further details of our stainless steel CNC machining services click here. Acrylic materials, including Plexiglas and Lucite offer optical clarity, high tensile strength, weatherability and good electrical properties and are typically used for displays, signs and electrical & electronics parts. Principle challenges faced in relation to the machining of Acrylics are the prevention of discolouration and melting of the component due to machining temperatures, as well as the reduction of tool marking and chipping. Acetal, including and Delrin™ offers a low coefficient of friction, elasticity and resistance to abrasion and is often used for bearing and gear systems, washers, seals and electrical components. Acetal is generally easy to machine and offers no greater challenge than reducing cutting marks for a smooth finish. Polyether ether ketone (PEEK) offers excellent chemical and mechanical resistance properties both at regular as well as high temperatures and is often used for bearings, mechanical parts, pumps, compressor valves and semiconductor applications through out the medical, electronics and aerospace sectors, as well as many other markets. Typically PEEK has a high thermal expansion and so this is taken into consideration when machining to avoid expansion and subsequent over machining by shrinkage when cooled. We work with both Nylon 66 and Nylon 6. Nylon offers wear resistance, low friction, high tensile strength, excellent impact resistance, high fatigue resistance, corrosion resistance, is lightweight and is easy to machine. Nylon is a cheaper material than many plastics and is typically used for bearings, bushings, valve seats, washers, seals, cams, gears, guides, wheels insulators and wear parts etc. Machining considerations include using sharp tools with high rake and clearance angles which minimizes the required cutting force and heat build-up. Secondary consideration is also applied to threading because holes can close up after taps are removed. Teflon (PTFE) offers excellent chemical resistance, electrical insulation, low friction, high dielectric strength, low dissipation and high resistivity. 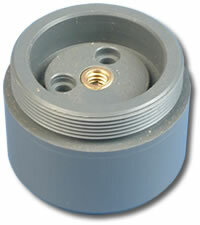 Commonly PTFE is used for pump parts, electrical insulators, terminals, bushings and rollers. Consideration must be given to its high thermal expansion which can make it elastic under machining resulting to dimensional changes after milling or turning. PTFE has a low modulus & resilience, practically no compressive or tensile strength and because of its high thermal expansion will move all over the place while it is being machined. A particular secret to successful machining of PTFE is to rough out components and then leave then to the side for a week to allow for any major dimensional changes to complete and then finish off. Polyvinyl Chloride (PVC) offers good corrosion resistance, is formable, lightweight, has excellent electrical properties, is impact resistant and is cementable & weldable. PVC is typically used for pipes & fittings, laves and nuts & bolts. Typically PVC is abrasive and requires cutting at low rpms with high feed rates using high grade carbide tooling. Polypropylene offers good tensile strength, chemical resistance and is stress-crack resistant and is often used in laboratory and hospital equipment as well as gaskets. 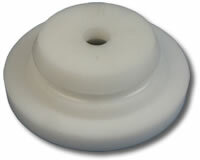 Due to its low glass transition temperature the Polypropylene surface has a tendency to become fluid when milled becoming sticky and bind to mill and drill bits; which requires low depth of cuts, low spindle speeds and high feed rates with either a good air jet to keep the cut clean or plenty of cutting fluid. Most of our work is with SAE/AISI 41L40 and 41L45, both of which are free machining. We also carry out alot of work with case hardening steels which are used for pins, shafts and bolts etc. Typically our aluminium machining uses standard free cutting aluminium and cast L111, L113 and L115. Our CNC milling, CNC Turning and conventional machining operations are ideal for working aluminium castings. The materials detailed above are ones commonly worked with here at Markell, however, we are always open to working with other customer specific materials. To find out more about our capabilities and ability to handle the machining of your materials please feel free to call us for more information.